"Sampath Speaking" - the thoughts of an Insurer from Thiruvallikkeni: cradling babies ~ the motherly care even during day's work ! cradling babies ~ the motherly care even during day's work ! In the 6th Assembly pools, it was represented by IsariVelan ~ from 2001, it has returned only AIADMK – and is a prestigious constituency now. hush-a-by baby - On the tree top, when the wind blows; the cradle will rock. One theory suggests the rhyme narrates a mother gently rocking her baby to sleep. When LiciaRonzulli took her 7week-old baby to work, she did not realise what a stir she would cause. Photographs of Ronzulli cradling her daughter, Vittoria, in a sling were broadcast around the world and published in newspapers from the US to Vietnam. For us used to seeing mothers cradling children to work – this is no news ! 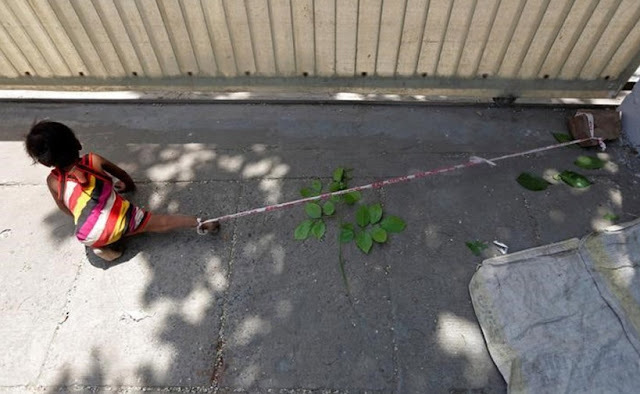 In one part of India, a 15 month old child having her leg tied with a rope to a rock at a building site in Ahmedabad. Sad, this child and many of her ilk spend the hot day out in oppressive heat, barefooted, caked in dust. There are about 40 million construction workers in India — vast majority of them women. The majority are poor migrants, who shift from site to site, building infrastructure for India’s booming cities. It is not uncommon to see young children rolling in the sand and mud as their parents carry bricks or dig for new roads or luxury houses.Sordid living conditions, poor educational and medical facilities, and lack of childcare inevitably characterise the lives of construction workers in the country. Sadly the people who facilitate growth would never be able to reap the benefits of the growth ! Moving away Dr. Radhakrishnan Nagar is a legislative assembly constituency in the city of Chennai, Tamil Nadu. It has been a traditional ADMK stronghold, now more famous of TN CM Ms J Jayalalithaa, getting elected from here. In 2012, I had on an Italian MEP representing People for Freedom, winning a seat in European Parliament elections and subsequently becoming member of the Employment and Social Affairs committee - she is LiciaRonzulli who took her 7 week-old baby to work. Photographs of Ronzulli cradling her daughter, Vittoria, in a sling as she voted on proposals to improve women's employment rights were broadcast around the world and published in newspapers from the US to Vietnam. The woman in news for attending the Parliament taking her daughter,is married to Renato Cerioli, who is also a member of the same party. She had earlier worked as a nurse in Milanand Bangladesh before becoming a hospital director and then turning to politics. Executives carry laptops / blackberry / ipads and other gadgets – this executive carrying child made the news. 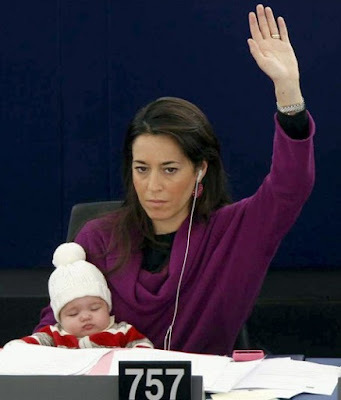 The flexible rule in European Parliament allows mothers to bring their children to work. Licia took multi-tasking to new levels, carrying Victoria as she addressed parliament and voted on important issues. If it happens in Italy, India cannot be left behind ~ perhaps, now read this report from Indian Express, Chennai edition. 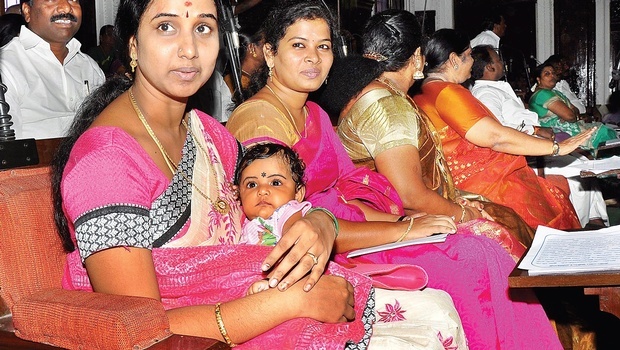 It was a pleasant surprise to her colleagues when R Sasireka, a 28-year-old first-time councillor representing the AIADMK for Ward 41 in R K Nagar stepped into the council hall for a meeting, with a four-month-old baby in her arms. Meanwhile, all civic works, put on hold owing to the assembly elections, will be carried out on priority basis, said Mayor SaidaiDuraisamy.Addressing the council meeting, he said pending works, including the ongoing storm water drain project in several wards, will be fast tracked. He also asked councillors to submit a list of roads damaged due to the metro rail within two days. A total of 18 resolutions, including one on provision of LED lights.The mayor promised to integrate the education and revenue departments in the expanded Alandur and Ambattur areas with the civic body.